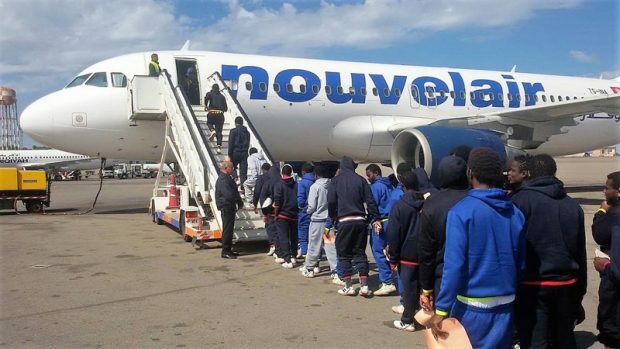 174 Nigerians were on Thursday night repatriated from Libya to their country, IOM reported. The illegal immigrants were received at the cargo wing of the Lagos International Airport by officials of National Emergency Management Agency. The repatriated migrants were brought back aboard Al Buraq Airline in Boeing 737-800 aircraft with flight number UZ 389-390 and registration number 5A-DMG from Sebha City and arrived Cargo Wing of MMIA, Ikeja, Nigeria about 9:45 p.m. They includes 62 adult females, 11 female children and 11 female infants, bringing the total number of females to 84 f while the males comprise 74 male adults, 12 male children and 15 male infants making it a total of 90 males.